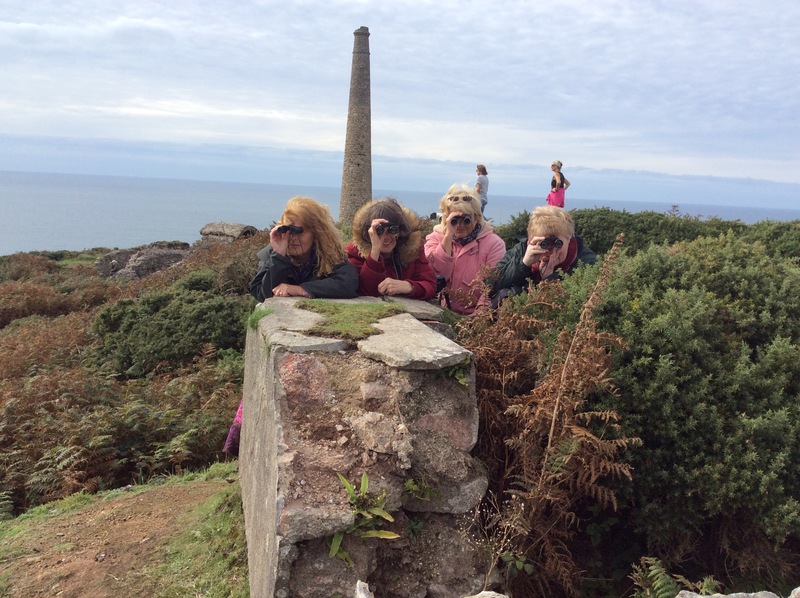 Following Poldark ( day 2?3?…8? Who the hell knows,) Fangirl Down! Far Lookers at the ready ! It’s a fickle mistress this fangirl stuff! Fangirl? Who the hell am I kidding, three grandmothers at least amongst us, but Fan-sad-old-woman is a bit of a mouthful. Day two on the wall following Poldark and the incumbents are becoming fidgety and slightly hysterical. Maybe it’s dehydration methinks, better pop into the excellent Count House coffee shop and see if Annie 1 or Annie 2 can administer Harrogate Spring Water (seriously NT? Carbon footprint? There’s a Cornish version) via a small pipeline to our somewhat disadvantaged vantage point. “Himself”s faithful followers are wavering in their loyalties, no longer Aidan’s Maidens since the frequent attention of the Lovely Liam, Prop hand extraordinaire, has won our hearts! (He may yet turn out to be spy as he comes bearing gifts featuring an entirely different and medieval themed TV production. We’re not fooled, we can’t see anyone in tights from here). So now Liam’s Ladies are lurking on the aforementioned wall and are actually winning him money with well timed trips to the loo! Turns out I was absolutely right yesterday about the crew running side bets! Irene’s husband, Geoff has finally made it round the coastpath from somewhere near Lowestoft we think. Who knows? We may have been here for months such is the entrenchment! Between us and the film crew is an overgrown No Man’s Land over which we apparently watch each other through binoculars and wonder what each other may be planning next from our respective dugouts. It occurs to me that perhaps we should break into a spontaneous rendition of Silent Night and advance upon the open ground with the Disney Princess Football I keep in my car for just such an eventuality! As they are apparently watching us just as keenly as we are watching them (and with far better listening equipment I may add!) we’ve considered entertaining them with dance routines from Grease or songs with well defined semaphore type choreography like the Village People’s “Y” “M” “C” “A”! It is abundantly clear that our blood sugar levels are dangerously low and delirium is setting in. Provisions are running low, the situation is becoming critical. Perhaps the Annie’s have cake or chocolate left, a search party is despatched. Oh no! Annie 2 is on set with a freshly applied coat of designer lipstick!… I kid you not! They’re toying with her affections, we may yet lose her and her Victoria sponge! It was at this point that a happy snap of our frontline throng seemed timely to improve morale and in getting up I lost my footing and descended inelegantly into the gorse laden mine workings. “Fangirl Down!” Went the cry amidst further hilarity and my wounded pride. If I hadn’t been so intent on salvaging some dignity I may have unearthed one of the innocent dog walking, by-standing stray professional photographers in pursuit of a rapid early redemption of their mortgage and an unexpected holiday in Mustique courtesy of the Daily Fail, Nail, Bail… Dashed autocorrect! These poor beleaguered individuals keep inexplicably finding themselves and their massively expensive image stabilising telephoto lenses accidentally concealed behind mine ruins and gorse bushes. Poor misunderstood souls! Some time ago we dispatched a scout into No Mans Land, she seems to have met with resistance or a very high wall, we may have lost her altogether. Geoff has given in and is advancing on to Cardiff as I write. Irene is changing her name to Annie 3 and preparing for a possible visit to their HQ. We don’t fancy her chances much either. But ours is a gallant band, ready to make a stand to the end and besides the Coffee Shop is behind our lines, as is their catering unit! However we do need to concede that their having posh mobile loos gives them an unfair advantage. Perhaps we could negotiate some sort of alliance? Liam! Please send out your second in command, preferably someone tall with a passably natural Dublin accent and a lot of lines to learn, clad in a long coat and tricorn! We are happy to negotiate our immediate withdrawal to the pub or we’ll just surrender and insist you take us all prisoner, seriously … There will be minimal, if any, resistance on our part! FYI, “Far Lookers” is a Cornish colloquialism for binoculars but it also describes both us on the wall and those in the far trenches of the film set. So much fun! I am so joining you from Australia next year!! !